Vintage Kids' Books My Kid Loves: The World Is Round - Re-released! 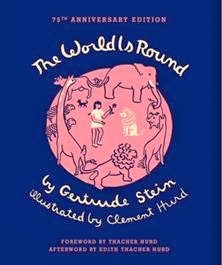 I just got an e-mail today from HarperCollins letting me know that a facsimile edition of Gertrude Stein’s only children’s book, The World is Round, is due out in October. If you've never read Ariel Winter's write up on it on his blog We Too Were Children, you are in for a treat! He includes wonderful photos of the original limited edition released at publication. Just fabulous! Anyways, illustrated by Clement Hurd, the beloved illustrator of Goodnight Moon and The Runaway Bunny, this edition is being released to coincide with the 75th anniversary of its publication. Written in Stein’s unique prose style, The World is Round tells the story of a young girl named Rose, who contemplates who, what, and, why she is, often expressing herself through rhyme and song. Although published as a children’s story, the book is a literary work for adults, too, as Stein focuses on themes of individualism and personal identity. As with many of her writings, Stein plays with words and language throughout the book, incorporating her most famous line, “Rose is a rose is a rose is a rose,” several times in the story. I really love this blog... came across it searching for "illustrated crows" and look forward to returning often!